Puerto Rico tacked on single runs in the second and fourth, five more in the fifth, another in the sixth and two more in the seventh to complete the blowout victory. Vizcarrondo led the way with three hits, including a double, RBI and two runs scored, while Efrain Nieves had three hits, an RBI and run scored. Soto added a pair of two-run singles, while Vincent and Ponce each had a pair of hits and combined for three RBI and a run scored. In all, Puerto Rico finished with 21 hits to defeat Chicago-Brooklyn for the second time in the tournament, the other being a 16-6 win during round-robin play. In its final two games, Puerto Rico, which finished round-robin play a modest 3-2, dispatched its opponents by a combined 33-1. The recipient of the offensive explosion was Puerto Rico starter Israel Chiqui. The right hander had little trouble with a Royals lineup missing a few key players, allowing only three hits during his six innings of work. Erick Gonzalez and Eduardo Torres combined to finish the five-hitter by pitching three scoreless innings in relief. 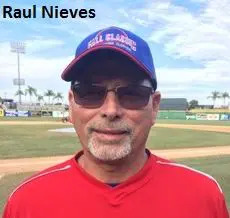 “He’s one of our guys,” Nieves said of Chiqui. “He was out there the first game and he was out there the last game. That’s how important he is to us.” While Chiqui was nearly unhittable, Angel Fonseca was even better. Fonseca tossed 15 innings without allowing an earned run during the tournament, including a 16-1 blasting of the Southern Maryland Titans in the semifinals, to earn team MVP honors. Chicago-Brooklyn reached the title game after finishing round-robin play 2-3. The Royals then knocked off unbeaten Fedlock in the quarterfinals, before dispatching Jimski’s Brewers 12-7 in the semis. WP: Chiqui. LP: Crump. 2B: Velasquez (C-B); Ramos (PR). 3B: Vizcarrondo, Soto (PR). Pitching: Crump, Tate (1), Fitzgerald (5), Mora (7) and Landing (C-B); Chiqui, Gonzalez (7), Torres (7) and Martinez.